After Pugh tried, unsuccessfully, to delay yesterday’s vote, will the measure intended to reduce emissions from Baltimore’s biggest industrial polluter get her signature? After the City Council unanimously passed a bill that would tighten emission limits on the Wheelabrator trash incinerator, the heavily-lobbied measure moves to the desk of Mayor Catherine Pugh. But with Pugh refusing to say whether she will sign it – and after she made an 11th hour plea to the bill’s sponsor to delay it – the spotlight has shifted from City Hall’s fourth-floor Council chambers to the executive branch on the second floor. “We want to make sure that the mayor knows that we would like our Valentine gift to be that we have clean air and that we’d like her to give us that as a present,” said Mike Ewall, of Energy Justice Network, after last night’s passage of Bill 18-0306. Pugh’s office isn’t saying whether she will approve the measure or veto it. “The mayor is reviewing the legislation, but she is all for clean air,” said her spokesman, James E. Bentley II, in response to a query from The Brew. The bill’s sponsor, Edward Reisinger, said he was called by Pugh to a meeting yesterday where he was asked by Pete Hammen, the mayor’s operations chief, to delay the vote so the cost impact could be studied. Council President Bernard C. “Jack” Young made the same request of him last week. “I told him and the mayor both ‘no,’” the 10th District councilman, who represents southwest Baltimore, said. “The mayor is reviewing the legislation, but she is all for clean air,” said her spokesman. Reisinger said Pugh expressed concern “about the life of the landfill,” and pressed him to meet with Department of Public Works Director Rudy Chow. The bill would affect the Wheelabrator incinerator, a landmark visible from I-95 on the south side of the city, and the Curtis Bay Medical Waste Services in far south Baltimore. 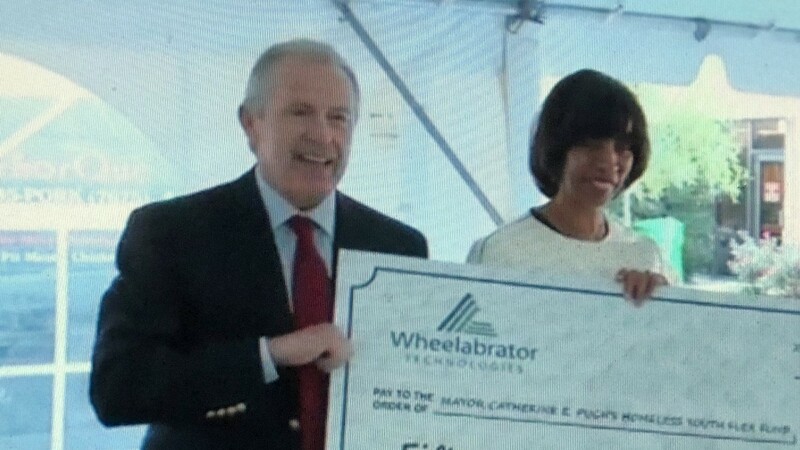 Last month, Wheelabrator contributed $1,000 to the Pugh campaign, and in November, it forked over $500 to Council President Young. In addition to meeting requirements to lower emissions of nitrogen oxide (NOx) and other health-harming substances, the facilities would be subject to constant monitoring under the bill. Wheelabrator has said the measure’s requirements are too strict to meet and would result in the company having to shut down. Last month, the New Hampshire-based company contributed $1,000 to the Pugh campaign committee, and in November, it forked over $500 to Council President Young. The company’s statement about having to shut represents “scare tactics,” Reisinger said yesterday. The trash-to-energy facility annually burns some 700,000 tons of refuse, with more than half of it originating in Baltimore City, and the rest coming from Baltimore County and other jurisdictions. Reisinger said he told the mayor she should tell the operators that they must stop accepting waste and ash from outside the city. “Then the life of the landfill will be extended,” he said. Considering the intensity of the lobbying over Bill 18-0306, yesterday’s Council action was strikingly drama-free. The bill was approved on a voice vote, with no roll call. All but Councilman Kristerfer Burnett were present. “I’m ecstatic,” Ewall said after the vote, which filled Council chambers with supporters and about three dozen Wheelabrator employees who came in a bus. The measure’s quick and unanimous passage represents a setback not just for Wheelabrator, but for the Pugh administration, which has been questioning the legislation based on estimates of its fiscal impact. Last week, as the Council was moving the bill forward with a key preliminary vote, administration officials were handing reporters and Council members printouts of DPW’s four-page estimate of severe fiscal impacts should the measure pass. Those estimates, which advocates dispute, were a key part of the talking points for many of the bill’s opponents, led by lobbyists for the two incinerator operators. Asked whether the mayor is likely to veto the bill, Reisinger declined to speculate. The last time she vetoed a popular bill, it came at a political price. After promising as a mayoral candidate – in writing – to sign any $15-an-hour minimum wage bill that came across her desk, Pugh instead vetoed the one the Council sent to her shortly after she assumed office. Community and labor activists who had waged a long battle to get the measure approved by the Council – and union leaders who financially backed Pugh’s mayoral bid – said they felt betrayed. Others said the about-face would be remembered by voters. “It’s disgraceful. And it’s going to dog her,” community activist Ralph Moore Jr. said at the time. If there is another veto, does Reisinger have the 12 votes required to override it? He declined yesterday to speculate on that as well. Last week, on second reader, the incinerator bill passed with 12 “yes” votes, one “no” vote (Isaac “Yitzy” Schleifer) and two abstentions (Eric Costello and Leon Pinkett). “I’ll have to do some counting,” Reisinger said. – Mark Reutter contributed to this story.